Hello gorgeous! It is the middle of the summer and it is the best time to talk about very gentle facial cleanser. Sometimes a day spent outside is just too much for my skin (even with high SPF). No one likes that feeling of tightness and irritation of the skin. And if you got sunburn on the one hand you want to cool your skin but on the other you want to calm your skin and make it feel comfortable. And some cleansers (especially foams and clay based cleansers) are just too harsh in these days. And you feel like they strip your skin way too much. So here is the solution! 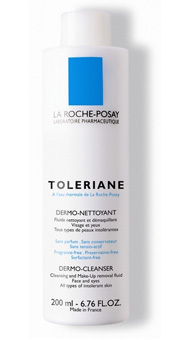 La Roche-Posay Toleriane Dermo Cleanser! It is cleansing and makeup removal fluid for face and eyes formulated for all types of intolerant skin. It is SOOOOO mild! I would say even much milder than Extremely Gentle Cleanser by Avene (you can find my review here). It can be used without water (of course you can rinse your skin afterwards if you need). The good thing about it is that cleanser dissolves all the makeup very well (I didn`t try this for mascara). Cleanser has a very lightweight jelly consistency. It has almost no smell to it (no fragrance added). It is also surfactant free (woohoo SLS fighters! this one is for you :) preservative free and even paraben free. And it has the shortest ingredients list i`ve ever seen (I talk just about cleansers). Ingredients: water, ethylhexyl palmitate, glycerin, dipropyleneglycol, carbomer, sodium hydroxide, caprylglycol/caprylyl glycol, ethylhexylglycerin. That`s all! Cik ilgi nāca paciņa? Es ļoti gribu La Roche Posay izmēģināt.